Coming out of high school, Rivals.com ranked AJ Dillon as the No. 1 prospect in Massachusetts and No. 20 running back in the nation. Originally, Dillon announced on Twitter that we would play at Michigan but enrolled at Boston College instead. As a freshman last year, he was named ACC Rookie of the Year and Offensive Rookie of the Year after rambling for 1,589 yards and 14 touchdowns, becoming the first Boston College player to win both awards. He surpassed 150 yards rushing five times, including over 200 twice. Dillon’s rushing yardage was the most ever by an Eagles freshman and second in the history of the ACC. 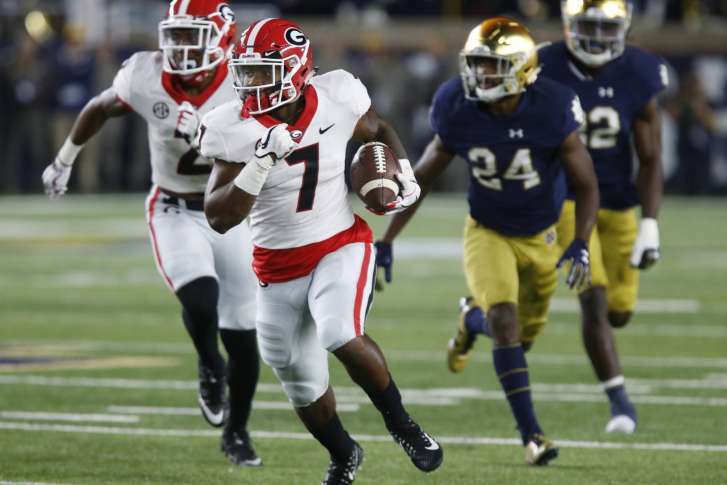 Against Louisville, he recorded his breakout performance with 272 yards and four touchdowns. At 6-foot-0 and 240 pounds, Dillon is a physical, downhill runner with very good athleticism. A thick and strong lower body, he is robust between the tackles with good vision and quick feet. Coach Steve Addazio likes to control opponents’ possessions with a run-heavy game plan, and the Eagles will employ three seniors and a junior along an experienced and deep offensive line. Dillon faces some tough matchups late in the season (at Clemson and Florida State), but CFF managers will enjoy a seat on the Boston College express beforehand. Why is college football such a great game? Walk-ons can become stars just like in the movies. Patrick Laird did not receive a scholarship offer yet earned a roster spot with the Bears and became an honorable mention All-Pac 12 selection last year after setting career highs with 1,127 yards rushing on 191 carries while scoring eight touchdowns. A remarkable pass catcher, he also made 45 receptions—the most by a Cal runner since 1988—for 322 yards and a touchdown. All five of his career 100-yard games came last season, and against Oregon State, he racked up career bests with 33 carries for 214 yards. Over the past two seasons, he has also been a Pac-12 All-Academic selection and loves to learn, promoting reading through the Patrick Laird Summer Reading Challenge. Second-year Coach Justin Wilcox will rely on a veteran offensive line and Laird to move the chains in 2018. The O-line returns all five starters (3 seniors and 2 sophomores) and all are over 6-foot-3 and 300 pounds. Laird is the only experienced ball carrier on the roster and likely becomes only the third runner in school history to exceed 1,000 rushing yards in back-to-back crusades. The Bluegrass State is better known for its horses and hoops than football. Yet, the Wildcats employ one of the most exciting ball carriers in the nation. Benny Snell, Jr. joined an exclusive club in SEC history: Only Herschel Walker, Knowshon Moreno and Snell rushed for over 1,000 yards and scored 13 touchdowns during their freshman and sophomore crusades. At 5-foot-11 and 223 pounds, the junior excels with good lower body strength, leverage and balance. A patient runner who follows blocks well, Snell uses his hips and feet to juke and avoid tacklers in traffic. In 2016, he was named True Freshman All-American by ESPN, and he established six school freshman marks with 1,091 rushing yards and 13 touchdowns. Last year, he led Kentucky in all major rushing categories with 262 carries for 1,333 yards and 19 touchdowns, becoming the first player in school history to exceed 1,000 yards in consecutive campaigns. He recorded seven games over 100 yards rushing, including a season-best 211 against Louisville. He needs 1,412 yards to become the Wildcats’ all-time leading rusher. In 2018, CFF owners are hoping Snell shatters the school record. Last year, UCF earned a New Year’s Six Bowl Game ticket. After winning eight of its final nine games, Boise State is one of the Group of 5 teams in the country knocking on the door for an invitation in 2018. If the Broncos are going bowling on January 1, 2019, junior Alexander Mattison will be instrumental in the team’s success. A scholar, Mattison has been named Academic All-Mountain West and Mountain West Scholar Athlete in both of the last two campaigns. In 2017, he carried the football 212 times for 1,086 yards and 12 touchdowns. A good pass catcher, Mattison snatched 28 passes for 284 yards and a touchdown. Against Colorado State last year, he totaled the third-highest rushing performance in school history with 242 yards. A three-star prospect by many recruiting services, he recorded back-to-back 2,000-yard crusades in high school as a junior and senior. Mattison is an instinctive runner with good lateral agility and stop-and-go explosion. 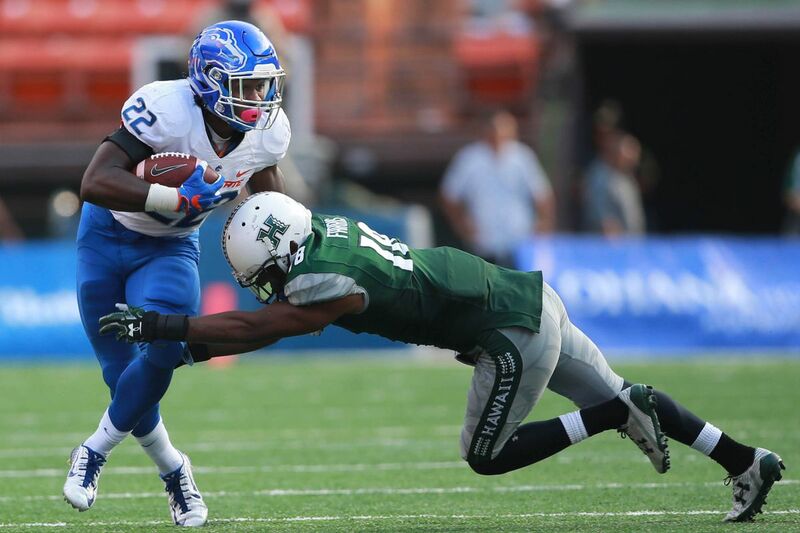 During the past decade, Ian Johnson, Doug Martin, Jay Ajayi and Jeremy McNichols have all provided a buffet of fantasy points for CFF owners, and Mattison is the next in line for a breakout campaign. Excuse my humble brag for a second: I drafted D’Andre Swift on my CFF Dynasty Industry team last year, and I am eager to see the sophomore this season. In 2017, Nick Chubb and Sony Michel combined for an astonishing 2,572 rushing yards and 31 touchdowns. Luckily for my Dynasty fortunes, both runners are gone and now play for Cleveland and New England in the NFL. As a true freshman last year, Swift played in all 13 games, earned 81 carries, rushed for 618 yards, snatched 17 passes for 153 yards and scored four times. Against Missouri, he set season-high marks with 94 yards rushing, including a 71-yard jaunt. A consensus 4-star prospect from Philadelphia, Pennsylvania, Swift is a versatile runner with speed and power. Breaking arm tackles, he labors with a low center of gravity and strong lower body. The sensational sophomore combines patience and shiftiness to burst through traffic or reach the perimeter of the defense with ease. A very good pass catcher, he is lethal as a slot receiver. Coach Kirby Smart wants a physical and punishing ground game and despite losing first-round draft selection OT Isaiah Wynn, Georgia returns one of the best offensive lines in the country. The Bulldogs continually recruit and cultivate stellar running backs, and Swift the next great in Athens, Georgia. During his first-year on campus, J.K. Dobbins penciled his name into the Ohio State record books: He became the fourth freshmen to exceed 1,000 yards in school history, setting the Buckeyes’ freshman rushing record. Dobbins was named Second Team All-Big Ten and Freshman All-American after rambling for 1,403 yards on only 193 attempts. He exceeded 100 yards rushing six times and averaged 7.2 yards per carry, which was the second best in school history. In the Big Ten Championship Game, Dobbins rushed for 174 yards and earned the MVP award. In high school, he totaled 5,149 rushing yards and 74 touchdowns after missing his entire senior season. A 4-star recruit, he enrolled at OSU without ever visiting the campus and started classes in January 2017. At 5-foot-10 and 212 pounds, the LaGrange, Texas product is an enigmatic competitor: He plays small and powerful. He has extraordinary vision and body adjustment with ankle-breaking moves and quick feet. The sophomore plants foot and explodes immediately in another direction with an awesome jump step and/or spin move. At Ohio State, running backs Archie Griffin (1974 and 1975) and Eddie George (1995) captured the Heisman, and Dobbins may very well be the next great Buckeye ball carrier, who takes home the trophy. In 2017, the Oklahoma State offense finished second in the nation in total yards (569 ypg.) and fourth in points scored (45.0 ppg.). With quarterback Mason Rudolph and receivers James Washington and Marcell Ateman torching opponents, most CFF addicts focused on the aerial assault. Yet astute admirers also observed the performance of running back Justice Hill, who produced another 1,000-yard crusade. During his first two years on campus, he has topped 1,000 yards in each season. In 2016, he was named Second Team All-Big 12 and Offensive Freshman of the Year, and in 2017, First Team All-Big 12. As a sophomore, Hill led the conference in every major rushing category: rushes (268), yards (1,467) and touchdowns (15). He eclipsed 100 yards rushing eight times and totaled 30 or more carries in three games. At 5-foot-10 and 185 pounds, the junior game breaker employs good vision and patience to find holes and bounces off tacklers and lowers pads to gain extra yards. During spring practices, Hill worked with the coaching staff to improve his pass-catching abilities and expects to be a superior all-around back, which is music to the ears of CFF diehards. In college football, depth charts constantly change, and in order to navigate the fluctuations, CFF owners must study coaches and their offensive systems. At Toledo, Coach Jason Candle has committed to the ground game over the past two seasons. In 2016, the Rockets ran the ball 54.7% of the time and rushed for 195 yards per game, and in 2017, called a run on 56.7% of the plays and totaled 205.2 ypg. Both Kareem Hunt (1,475 yards and 10 TDs) and Terry Swanson (1,363 yards and 14 TDs) excelled for coach Candle and CFF diehards during the past two years. When training camp opened last summer, Shakif Seymour was fourth on the depth chart in the backfield. Seymour continued to grind hard, earning carries throughout the campaign. He finished the crusade with 116 carries for 702 yards and 12 touchdowns. A powerful runner, he is the thunder in the Toledo ground game and runs with vision and burst. At 5-foot-11 and 218 pounds, Seymour makes fluid cuts and employs a nasty stiff arm to avoid tacklers. In 2018, the sensational sophomore becomes a weekly starter.